“Asking questions” is my way of learning! I have found that asking questions does not only help me to learn but also makes every day in my life an opportunity and adventure to explore the universe around me. In fact, it is the way that I can start communicating with nature and keeps me enthusiastic! This is why many colleagues have called me “Ali questions”. I finished my high school from King Fahad Secondary School, Bisha, Saudi Arabia, in 2003, then moved to Riyadh to provide me with the opportunity to experience different cultures and people and to pursue my undergraduate studies. In 2008, I received the BS degree in Electrical Engineering from King Saud University (KSU). At KSU, I was the recipient of the best undergraduate project award. 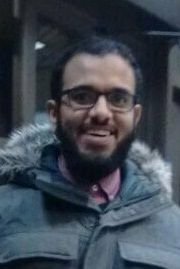 Presently, I am a teaching assistant at King Saud University awarded a scholarship to pursue master and Ph.D degrees at the Electrical and Computer Engineering department, University of Waterloo, Canada, under the supervision of Prof. Omar Ramahi. In 2012, I received the MASc degree in Electrical and Computer Engineering. The title of my MASc dissertation is “Detection of Sub-Millimeter Surface Cracks using Complementary Split-Ring Resonator.” Currently, I am a PhD candidate with main research focus on the development of new generation of microwave-near-field sensors. Now that you know a little bit about my academic background, I will tell you a bit about my personal life outside the University. I am blessed with a lovely wife, Atha, and twins, Mohammed and Abdulaziz. With them, I spend a lot of time playing, sharing some ideas, learning, asking questions, and making jokes (enjoying every moment). Regarding my hobbies, I am a cook, remote airplane pilot, and table tennis player. In addition, I like discussion in any subject because I believe that it is the birth of Ideas!